After leaving the campsite at Cosnino Caves Whipple’s group continued west toward San Francisco Mountain. 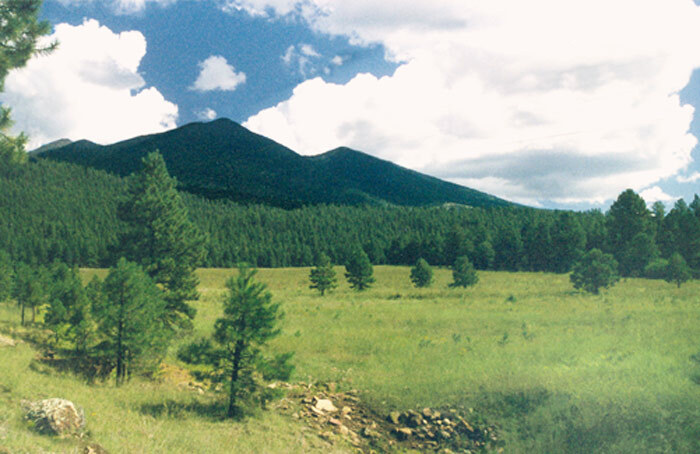 They camped in what is now the east side of Flagstaff, Arizona and then moved on to this spring on the southwestern flank of the Mountains. The main party spent a few days here while Whipple reconnoitered to the west. Fort Valley below Leroux Spring. Tom Jonas photo. 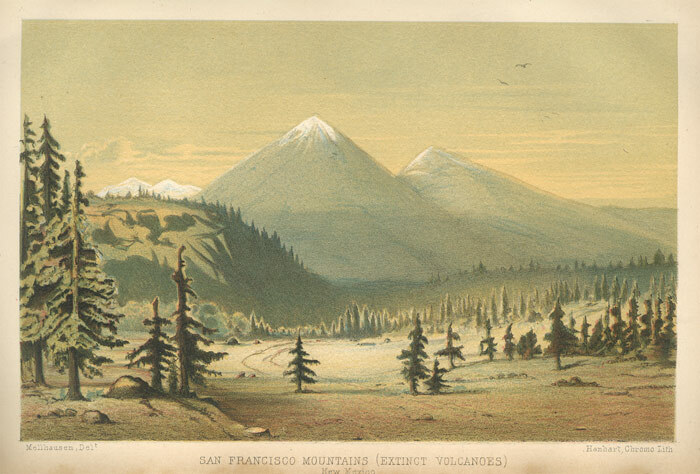 December 17.—To search for water, this being our third day without it, we turned the southwest point of San Francisco mountain, and, avoiding the valley on the left, kept up on the spurs close at its foot. After travelling about seven miles, we reached a permanent spring that poured from a hillside and was lost in the grassy plain below. In honor of the guide it was called Leroux’s spring. It is the same to which he conducted Captain Sitgreaves two years since, but by a different route, passing around the north and the western base of the mountain. December 29—camp 91.–… This morning, the summit of San Francisco being visible, the triangulation commenced yesterday was completed. The height above Leroux’s Spring was found to be 4,673 feet, making it about 12,000 feet above the level of the sea. At noon, the temperature of the spring, where it issues from the hill-side, was measured. The immersed thermometer read 48.8 degrees; 3.2 degrees higher than the surrounding atmosphere. That is probably the mean temperature of the place. The water pours, in several streams, down the ravine, producing a fringe of green herbage. Copyright © 2019, Southwest Explorations. All Rights Reserved. | Created by Tom Jonas.